Do you get a pit in your stomach every time you step foot in the garage? If the disorganization there is having an effect on your daily life, it’s time to take control! Start by exploring custom wall storage options. By mounting bikes, tools and sports equipment on the wall, you free up floor space for larger equipment, not to mention your car. 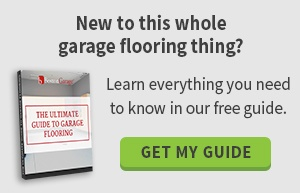 Learn the benefits of the following garage storage ideas to decide if you should install them. The whole family’s bikes can hang securely on the wall, removing them from the floor and clearing up walking space. This custom wall storage solution keeps bikes within reach so you can easily remove them from the hooks on a daily basis if your family rides a lot. It also serves as the perfect wintertime storage solution when you don’t ride your bike for a few months. Bike hooks are large, sturdy and easy to mount to the wall. Choose a permanent place for the hooks, since installation requires you to drill holes in the garage wall. A similar option is to install a large section of ORG Wall, which features moveable hooks for mounting all sorts of equipment and supplies. This versatile option lets you add or remove hooks with ease so you can relocate wall-mounted items as needed. If you have a workbench in the garage where you work on repair projects, you may be tired of digging through your toolbox every time you need a hammer, wrench or screwdriver. A magnetic tool bar is an effective garage organization solution that also looks great. Mount the bar to the wall behind your workbench and effortlessly hang a multitude of tools to keep them within reach without cluttering your work area. Sometimes the key is to focus on the small things to help your garage become a more productive space. 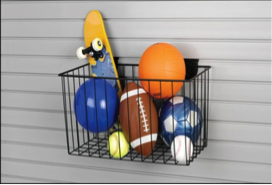 How are you currently storing bulky sports equipment? If basketballs, baseball bats and tennis rackets are free to roll all over the floor, you have a safety hazard on your hands. The equipment is also liable to become damaged if it isn’t stored correctly. Large baskets mounted to the wall or ORG Wall System are the perfect custom wall storage solutions for keeping your gear safely off the floor. If you don’t have time to delve into garage organization, seek help from a professional. At Boston Garage, we help families reclaim the garage and transform it into the most organized room in the home. Schedule a free on-site design consultation and learn all sorts of garage storage ideas from the experts.